Click for Harmony: New Pieces of my Training Puzzle. New Pieces of my Training Puzzle. I joined Epona TV recently and Gerd Heuschmann's DVDs, along with Alexandra Kurland's Hip, Shoulder, Shoulder DVD and Marijke De Jong's Straightness Training (and watching Anja Beran's Elegant Dressage Training 3 DVD which made me remember why I wanted to do all of this anyway!) have all combined to help me find a few more pieces of my jigsaw. Gerd Heuschmann talks about the horse only having strong, swinging back muscles if the bends in the S shaped curve of the cervical spine are open, pulling the whither's forward, which means the horse's neck must not be compressed and shortened or the back muscles will be blocked and the hind leg cannot swing forward under the horse's centre of gravity - a pre-requisite of collection and of riding the horse in good balance. 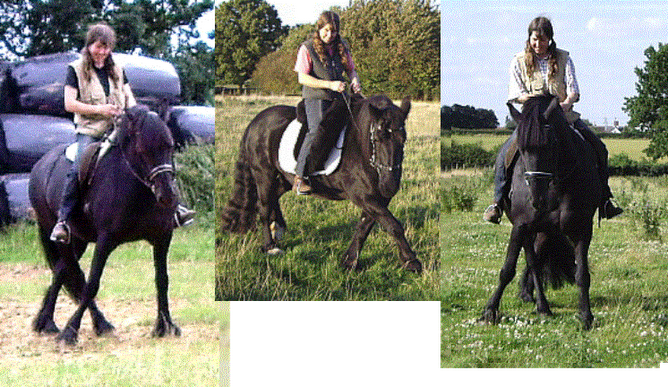 Whatever height the horse's head is carried at the neck must be reaching forward to allow the rest of the horse's musculature to move freely and do it's job unhindered (Marijke talks of forward forward, and forward up as the more advanced head carriages). Marijke De Jong says that horses rise in status in the herd when they are taught to carry themselves proudly and that horses, like us, enjoy realising their own potential. 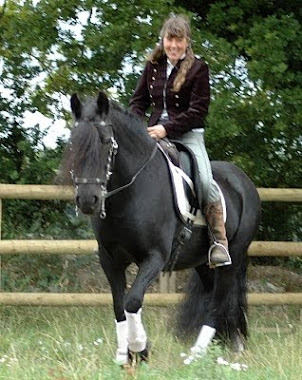 She, like Alexandra Kurland, says that good physical balance leads to good mental balance and Marijke says that beginning by training a forward down head carriage creates a mentally relaxed horse as well as a physically relaxed one. 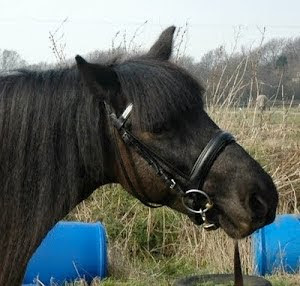 Marijke says that the head needs to be low enough in forward down that the underside of the horse's neck is relaxed. Both Gerd Heuschmann and Marijke insist that warming up horses in the forward down position (not head curled back and down) is vital to keep the back muscles swinging and moving freely and that forward down should be used regularly in training sessions between movements. Gerd states that the quality of the horse's training can be assessed by the strength of it's back muscles and the freedom of their (the muscles) movement. I have neglected training forward down a bit with Bella as she naturally carries her head quite low and she is not of a nervous disposition. I've spent a lot of time getting her up off her forehand and I reckoned that she spent most of her time in forward down anyway so I didn't need to train it. Yesterday I began working with Merlin again following the Straightness Training system. First you get the horse to lower his head when asked and then to bend his neck laterally in both directions at halt, standing in front of the horse. Then you ask for forward down and lateral bend from the horse's shoulder and, when you have both, you walk on with the horse and try and get him stepping under his own centre of gravity while keeping his weight evenly balanced over both front legs. This was a bit of a wrestling match with Merlin to begin with because, even though he is a left bended horse, he tends to fall onto his inside shoulder and walk into you with the first step on both reins. By applying some gentle pressure on his inside shoulder to keep him off it and to keep the bend to the inside as we walked forward he began to manage some clickable starts. I also realised to help him to be successful I had to make sure his inside hind was underneath him and not stuck out behind, before I asked him to walk on. Merlin was quite tense, pushy and a bit nippy at the start of our short session but by the end of it he felt to me really chilled, relaxed and content. I did a bit with Grace and Jack as well. Grace tends to find forward down a little tricky but, once we find it, she feels much more flowing and elegant in her movement. Jack LOVES working in forward down and he's very supple in his neck and body, and well balanced, so it's always a given with him anyway! Then I got Bella and did some forward down and lateral flexion training with her, both in hand and a little on the lunge. Bella is the only one of my horses who is right bended and I did notice that she loses inside bend a lot more easily on that rein when she's on the lunge and has less support from me. I've also realised recently that although Bella flexes laterally she doesn't flex very much - she's a bit stiff in her neck on both sides - and I've been working on flexions at the halt under saddle for a week now, clicking her when they feel right, and I've noticed that she looks so much more elegant and dignified when she gives me a bit more flexion. She feels like a really classy dressage horse. After a short session doing LFS (Straightness Training speak for lateral bending, forward down and stepping under) I finished by asking Bella for some Spanish Walk. I was totally amazed by what she gave me! She's usually a bit stompy in Spanish Walk, especially after a few strides, but with every stride she gave me maximum reach and put her foot down softly and elegantly. She felt SO chilled, relaxed, happy and at ease, even for Bella. I definitely won't be neglecting forward down and really good lateral flexions from now on!!! After watching Anja Beran and her stunningly beautiful Iberian stallions I have another movement on my wishlist now, along with piaffe and passage - Spanish Trot!! !